With our past vans, we have learned that it’s basically mandatory to have a nice conformable are to sit down and relax. We had a bed that folded into a couch in our Australian van, Damon. We had comfortable swivel back seats in our New Zealand rig, Cruz. Now, in our largest rig, Kiki Fubu, we needed a legit couch for chillin. Some people can’t start their day without coffee well, Dani can’t start her day unless the bed is made. So having to “break down” or “set up” the bed isn’t seen as a chore to us. We would rather the living space to cook, edit, eat, or stretch, than have a stationary all the time bed. 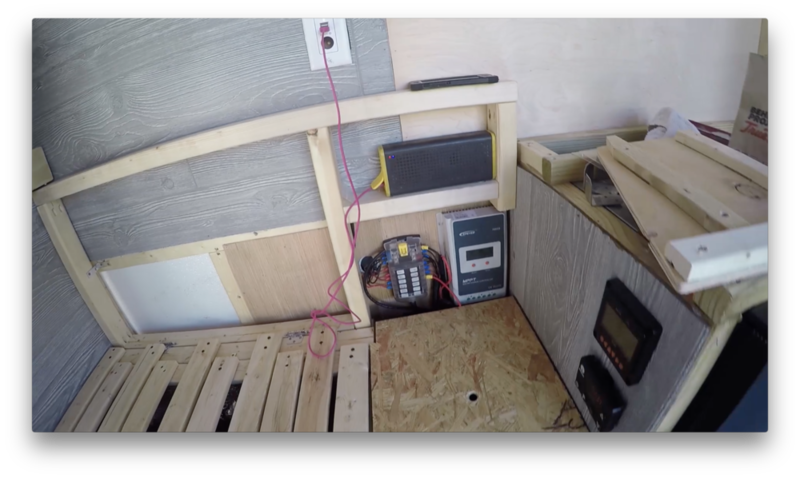 We knew going into the couch build that it was going to have some sort of underneath storage, house our battery bank and all our electrical components, as well as, housing the inverter that sticks out with 110v outlets at the bottom of the couch. As you saw in the beginning of the video, we had to move the solar controller and battery bank around quite a bit to accommodate the storage for them to get them out of sight, without taking up too much space, and keeping them readily accessible. One half the couch seat will open like a chest and have tons of storage. The other half would have a removable top to easily access the batteries and add or fix anything we need no sweat. 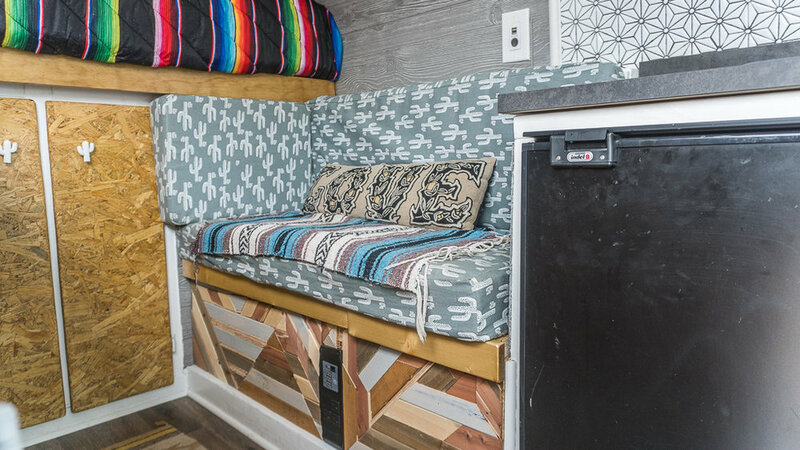 The back of the couch will have a flip down storage on one side, and a door that swings open offering easy access to the electrical panel and solar controller. Now, with it all planned out it was time to frame the couch out. We used 2x3’s to frame out the couch and anchored them all to the van with heavy duty L brackets. 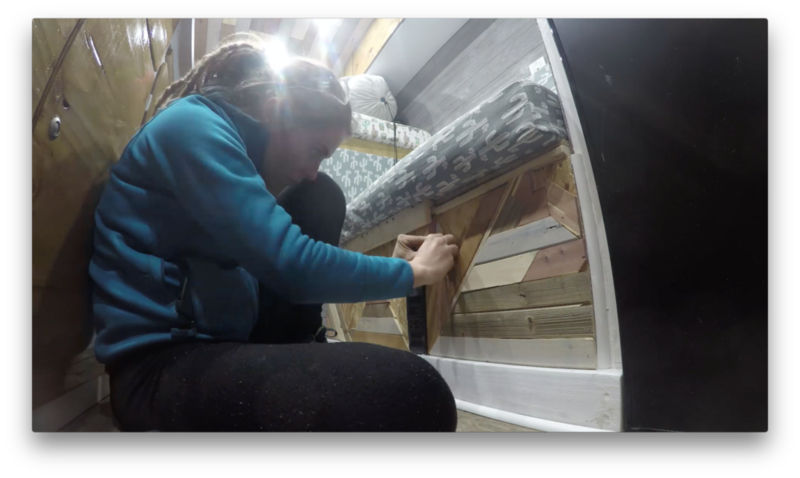 The couch frame is also anchored into the bedframe, as well as, the countertop. So it is tied in very nicely. We used bed slats for the top and tried to add a pull out chaise lounge type effect, but still have yet to figure out how to make this work. The idea was to combine the ottoman we will built, with the pull out chase lounge to have a small bed if we had a guest. This is still in BETA but will be figured out as we go. We had an old foam IKEA mattress that I used to use for ski bumming around Canada. Dani cut it to size, sewed the fabric together, and added zippers to everything. So that way, we can remove it and wash it down the road. She also sewed a few throw cushions to go with it. Being from the desert, we chose a fitting cactus pattern for the couch and it looks amazing. Dani also was able to make a nice little wood mosaic with the scrap wood from the roof. I’m really lucky to have such a crafty sidekick to make the van look amazing. 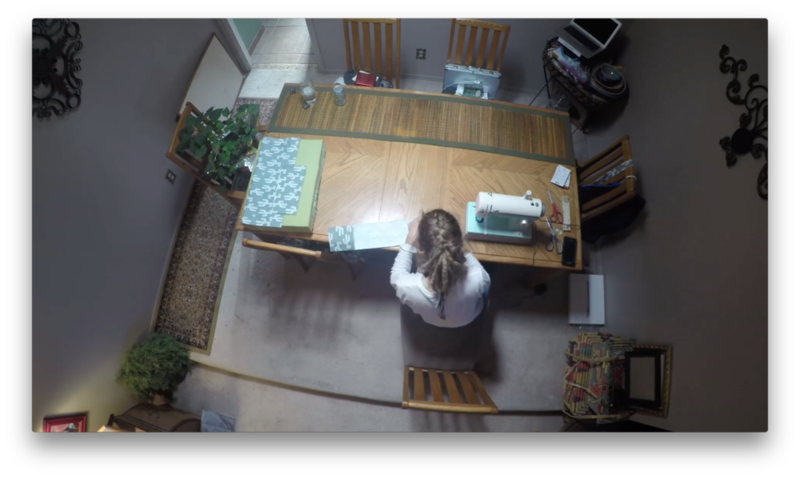 With the addition of the pull out table that comes out from the kitchen countertop (See Video), the couch is easily the most functional sitting arrangement we’ve ever had. Whether it be in a house or a van, it serves so many purposes. All those possible functions and purposes are what you need to consider for every single part of building your home on wheels.